The best deer feeder is a highly valuable tool to have especially if you are a hunter, or only interested in observing deer. If the deer feeder is used successfully, it will be able to bring a lot of traffic from the deer; this is the various hunting grounds where you have planted your deer feeder. When we critically evaluate deer feeders, it will give you a variety of options and at the same time, some can serve different purposes. The deer feeders have undergone various improvements, this is from having the ability to purchase automatic feeders that are self-sufficient for several weeks, or have a feeder that will keep the small creatures at bay, that is a raccoon-proof feeder. You guys must be wondering what are the finest deer feeders available in the market? How to choosing the best deer feeder in 2019? 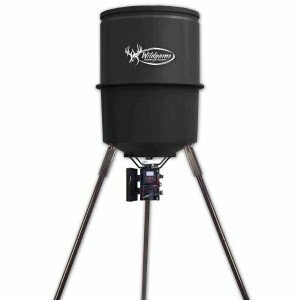 The Moultrie 30-Gallon feeder is among best deer feeder ever available in the market. It is no more than 6-ft high and quite easy to fill. The new design makes it faster and simpler to assemble; it takes you less than five minutes, and you do not require any tools. You only need to tighten the hopper with the wingnuts that come in the package. You then screw the cap on lock the feeder in place, secure the legs, and you are good to go. You no longer have to waste time you rather be doing something else on assembling a feeder. – The best thing about this feeder is its assembly. It is quite easy to set up, and the design seems to work perfectly for its purpose. It is user-friendly and programming it is no hurdle. The 30 gallon is all-plastic hence not rusting. It is watertight and does not leak or let water inside. It can also use a battery. It has camera mounts, for up to three cameras, this is perfect for those who may like to capture more than one image or video. It also has a built-in battery level monitor that lets you know when you need to change your batteries. One major downside is that it does not come with a battery; you have to purchase it separately. Due to its large size, it holds too much feed, which can sometimes be disadvantageous due to wastage. The varmint guard does not work efficiently, and you might need to secure it with a wire cage to keep squirrels and other rodents away. The Moultrie All-in-One Feeder is great we can say it best deer feeder for money for its amazing affordable rate. It is an all-round feeder that requires no setting up. Just open the box and take out the bucket. Everything you need to begin feeding is included. The programmable digital deer feeder timers can make your work easier. Just add the feed and let it be. The timer can be set up to four times per day. it has probably best deer feeder timer. If you adjust the timer at three to six seconds feedings daily, the AA batteries can go up to a full season. It is also big enough to hold almost a full bag of feed. Its design makes it convenient for space saving. The spinner throws grain a good distance from the feeder. Another great thing about this feeder is that it is attachable to a solar panel. Birds can continue feeding even if there is no power source. It has a sticker on the bottom which gives you the ratio and shows you how many secs equals the x amount of corn. It lets out many feeds; therefore, you can help us the feeder to feed chickens. The best thing about this feeder is its functionality and ease of use. One major concern is that squirrels and others rodents will destroy the lid in less than a month once they discover where the corn comes from. You might also not like the spin plate, as it is so close to the bucket. This makes the whole corn grains stick in between the bucket and the spinner. When this happens, the spinner will stop working and may need replacement. 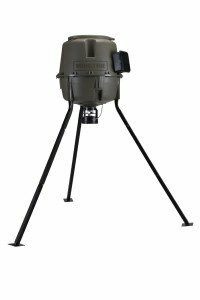 The Quick-Set 270 Feeder features a 30 ft./360degree range. Setting up this unit will take no more than 15 minutes. It can be programmed to feed 4 times a day. This feeder has an ideal galvanized steel spinner plate and the digital power control unit has a new look. The feeder comes with a 40 gal/270 lb. poly barrel looks and operates on a 6 V battery. It is great for bird watchers and those who love birds on their porches. It is a very versatile feeder for birds. This feeder is quite simple to install because of the rivets that come with it; installation takes only 15 minutes. It also has a built-in funnel that guides the feed, thus reducing wastage. The long-lasting 40 gal/270 lbs. Poly barrel design can serve you for several years; as a result, the feeder is a great buy for the price it goes for. The power unit has a unique new design. The galvanized steel spinner plate is rust-resistant. It is easy to use and can be mounted anywhere. Accordingly, it is worth its value if you are passionate about birds. It is also durable and made of high-quality weather resistant material. The points at which the legs go into the barrel seem weak and may break so avoid filling it more than halfway. It has best deer feeder motor which is too powerful. The corn can be thrown further than you expect which could hit someone, hence it has best deer feeder motor. You will be disappointed to know that the 6v battery is not included when you purchase the feeder; this means that you have to buy it separately. For the past quarter-century, has been at the forefront developing and producing some of the most innovative game feeders to date. American Deer Feeders are designed to fulfill requirements of everyone involved with wildlife. This 225 lb. 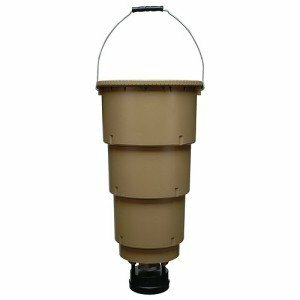 Barrel Feeder with RD-Pro Kit from American Hunter has a long-lasting heavy-duty partition that can store more feed. This is the ultimate option for bird lovers and is the most innovative game feeder in the market. This product is made of heavy-duty materials and has sturdy metal leg mounts. The program fixed on the dispenser of this item feeds birds one to six times per day. It can also be programmed to feed on different days of the week. It comes with a solar panel, making it self-sufficient and can function whenever there is no electricity. This guarantees that you can still hunt or watch your favorite birds with the help of this revolutionary and innovative device. The feeder itself and the accessories will attract the attention of a more wild game. The legs may be too high for a short person to put the corn inside the feeder. You also have to buy the batteries separately. You need to put axle grease on the poles or use carpet tack strips to keep squirrels and critters at bay because it does not have a varmint zapper. Furthermore, it requires regular maintenance because the corn or feed may clog the spout of the feeder. You might get shocked when you touch it. 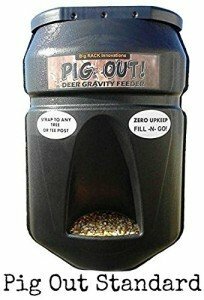 If you are a hunter, rancher, nature watcher, farmer, enthusiast or anyone seeking adventures like feeding deer, wildlife, livestock and other animals in their natural habits, then the ‘Pig Out’ deer gravity feeder is ideal for you. The feeder can be mounted to any tree size easily and fast. It is best gravity-fed deer feeder. Thus, there is no need for batteries. It has no moving parts making it work with minimal noise, and it can hold significant amounts of food. The Snap-On lid lets you add feeds much faster. It has a large feeding mouth making it convenient for deer to feed. The back of the feeder has a concave design with molded bumps that prevent it from slipping off its position. It is weather-resistant, durable and drains easily. You can still feed the deer while keeping pigs away. Not forgetting you can use nonstandard batteries with this feeder. Its versatility makes it an animal lover’s companion. What you might not like is, it is not rainproof, and when it rains the feed on the tray is soaked and gets moldy. It is also disappointing that it does not come with the strap. It has a great design, but it is fragile and made cheaply. As a result, this may make the feeder less durable and may wear out sooner than expected. For the price, you might also expect a larger size feeder. Some of the units do not come with the manual or instructions. If you are looking for a feeder for the wild, you would expect a sturdier build, but this one is not so. The feeders that you will find on the market come in different sizes and shapes. The majority of the feeders that you will find are basic models, which are to do one job, and that distributes the feed for the wildlife. The particular design of the feeder is what makes the difference. As a result, when you begin to hunt for a feeder it will require you know the general time the deer will be moving into the area, in order to identify the appropriate design. Therefore, it is advisable if you get a model that is as compact as possible. You will need to remember you do not only carry the feeder to the location but also the feeds. As a result, if you get a good location that cannot get the ATV or truck to refill the feeder it might prove to be time-consuming for you to maintain it. Hence, figuring out the best feeder will need you to plan the logistics so that you are aware of the best feeder to purchase. 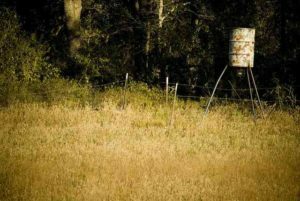 Why you need a top deer feeder? If you are a lover of wildlife, monitoring their every move or just love indulging in hunting expeditions, then you should already be having a deer feeder. As the new season is rolling in it would be a good idea to have your deer feeder ready and set up as it will be of great benefit to you as a hunter, it will immediately give you the front row seat in observing the deer. I am sure you are wondering who am I to make these judgments on the top five best deer feeders. Well, it is simple; it is because I have learned the importance of having a good deer feeder during my several hunting expedition. Moreover, if you are like me who does not like missing on the deer action as the new season is rolling, then the review below will help you identify the feeder suitable for you. As a result, the guide below is ideal for hunters, or if you simply enjoy observing the deer as they come to feed. 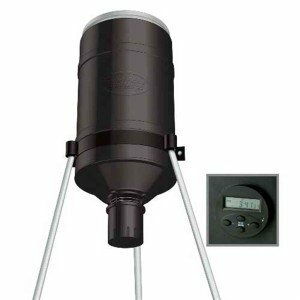 The above list will help in identifying the best deer feeder in 2019 for you. However, having the perfect deer feeder will not be able to perform if you have not positioned it in the correct area, fill it with the proper feeds and regularly maintaining it. As a result, it is also advisable if you are well educated on the potential feeding area to manage your deer population.